NUR/LIGHT. Afghan Diaries is an exhibition of photographer Monika Bulaj, which after being presented in Venice in the Loggia of the Palazzo Ducale and Rome to the Photographic Workshops, is housed in Trieste, in the evocative setting of the former Fish Market – Hall of Enchantment, enriched with new images and texts, interventions in the city’s open spaces and a conference theme. NUR/LIGHT. Afghan Diaries is a collection of images of great quality: In addition to the impeccable technical/composition of photographs, realized alike in color and black and white, stands out the author’s sensibility, which creates a series of intense images, sophisticated, experienced and brave as the business itself. Refusing to travel with the military as a photographer ‘embedded’, Monika Bulaj was able to “enter” and mingle with people and traditions of the places visited, whether Kyrgyz villages to cities – Kabul as a spectrum, resulting in complete confidence, enough to be able a shot in delicate situations such as hospitals, mosques, public baths, gymnasiums, schools and prisons. His work also highlights another Afghanistan, often hidden by stereotypes and prejudices masked by, the women, told through photographs that capture their genuine expressions. Again, just Bulaj Monika describes the project in Trieste “The Old Fish Market, with its smell of seaweed and golden water of black stone, was perhaps the secret heart of Trieste. Sliced by rays of light, majestic and transparent, this could seem like the Parthenon in Vienna on the Adriatic. Or, the agora of fishermen with faces like pumpkins roasted, Austrian and Jewish housewives, farmers and Slovenian Greek rulers. And, then, the gymnasium, where the confused hum of voices, the drone of recalls, children learned the names of fish, boats and twenty. The Trieste was called Santa Maria del loads. We came in as we enter into a basilica, instinctively looking for the altar, the columns and aisles. We have created a minimal installation, clear the scaffolding of a temple is not finished, as in a city under siege, where people have forgotten their dreams, or to have lost my strength. We filled with voices of bazaars and streets of Kabul, with weeping of women, children and songs of Sufi mystics. Howling, neighing, bleating of great silence of the Hindukush and Pamir. The faces of the Afghans were lying naturally in almost Byzantine iconostasis empty niches, already present in its original plan. But also look out the windows and walled gardens on fallow alleys of the City. Pass the thresholds of the doors locked, inhabit abandoned houses, mingle with the shadows of passers-by. 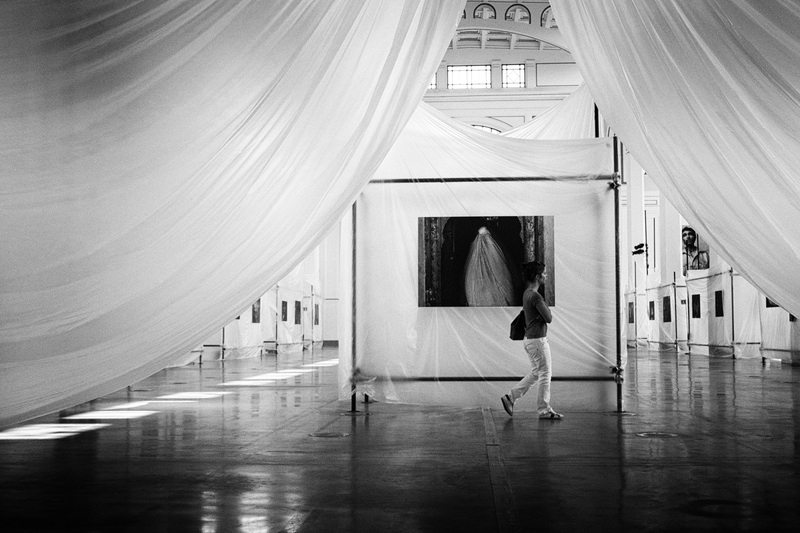 Their presence is discreet, just a trace, a whisper: AFGHANS PASSAGES IN TRIEST. But the exhibition, is also and above all a chance meeting with the great witnesses of Afghan history, researchers, journalists, diplomats and doctors. Their stories will be devoted to the three day meeting AFGHANISTAN, THE BIG GAME OVER, to be held in the Auditorium of the former Fish Market -Hall of Enchantment 7 to 9 September next, during which we will speak of spirituality and anthropology, history and current affairs, war and everyday life, with particular attention to the legal issues and odyssey of Afghan refugees in Europe “. ALBERTO CAIRO, Kabul, ICRC, Kabul, which was nominated for the Nobel Peace Prize in 2010, physical therapist, journalist and writer; SORAYA MALEK, princess descendant of Afghan King Amanullah reformer (died in exile in Italy and Europe at the beginning of last century ); MARIO DONDERO, photographer and journalist, will tell us about his experience in the Emergency hospitals, ANDREA ANGELI, a diplomat for nearly twenty years involved with the United Nations in the role of peacekeepers, former spokesman of the ‘EU Mission in Afghanistan; EMMANUEL GIORDANA, journalist, co-founder of Lettera22, editor of the monthly “Earth” and director of the Agency Media “Amisnet” of Rome is one of the conductors Radiotre Rai Radio 3 and World at one of the promoters of the “Afghan”; received in December 2011 with Lisa Clark, on behalf of “Afghan”, the Peace Prize Tiziano Terzani, ENRICO DE MAIO, diplomat former ambassador of Italy in Pakistan and Afghanistan; GIUNCHI ELISA, the author of two essays on “Afghanistan” and “Pakistan”, is a professor of history and institutions of Islamic countries to the Department of International Studies, Faculty of Political Science, University of Milan, GIOVANNI PEDRINI, an anthropologist and orientalist, head of the research project “Ethnic Identity and Cultural Borders in the Wakhan Pamir (Afghanistan) “University Ca ‘Foscari of Venice; BATTISTON GIULIANO, researcher and freelance journalist, writes reports, especially from Afghanistan and is currently engaged in two research into Afghan civil society and the perception of the Afghan presence foreign; SERGIO UJCICH, official spokesman of the Islamic Cultural Center of Trieste and Friuli Venezia Giulia, ALEXANDRE PAPAS, a researcher at the Centre National de la Recherche Scientifique in Paris, historian of Islam and Central Asia, and in 2006 received the award for the best doctoral thesis at the Institute for the Study of Islam and Muslim societies in the world, mainly deals with Sufi mysticism, the worship of the sacred and the political and religious issues in Central Asia and neighboring areas from 16 ° century to today, KHALED FOUAD ALLAM, a writer, journalist and sociologist Algerian naturalized Italian, assistant professor of the Faculty of Political Science, University of Trieste, where since 1994 he teaches Sociology and History of the Muslim world and Islamic countries ‘institutions, and all Islamic’ University of Urbino; HERMANN KREUTZMANN, Professor of Human Geography, Director of the Centre for Development Studies, Director of the Institute of Geographical Sciences at the Freie Universitat Berlin, assets with a long experience of field research in Asia-center North and currently holds the position of director and principal investigator of the Competence Network “Asia Crossroads” funded by the Federal Ministry of Education and Research (BMBF – Bundesministerium für Bildung und Forschung); ANTONIO DE LAURI, PhD in Human Sciences – Anthropology of the Contemporary . You Fondation Maison des Sciences de l’Homme in Paris and Nanterre Postdoctoral Fellow. He edited the volume “Poems Afghan hjcontemporanee. A trip through the knowledge “and is author of” Afghanistan. Reconstruction, injustice, human rights, “in which he analyzes the limits of legal and judicial reconstruction effort in Afghanistan, with a look-anthropologist lawyer, ANTONIO PALMISANO, Associate Professor of Anthropology and Cultural Politics in Anthropology at the Faculty of Political Science, Course Degree in International and Diplomatic Sciences, University of Trieste. Senior Advisor for Judicial Reform, within the Rebuilding the Justice System Program, the Italian government entrusted by the Bonn Agreement of 2001. With the Judicial Reform Commission, Kabul University, UNICEF, WHO, has conducted and directed extensive research on issues of social and political organization and the tribal and village on alternative forms of conflict resolution and on the structure and organization of the informal justice in Afghanistan, ROSEL VATTA, pediatric nurse with long experience in hospitals and Panjshir Anabah EMERGENCY, and architect RAUL PANTALEO, designer of all hospitals and polyclinics of EMERGENCY; FABRIZIO FOSCHINI, orientalist and political analyst, GIOVANNI DE ZORZI, Professor of Enthnomusicology at the University “Ca Foscari” of Venice. For nearly 20 years dealing with classical music and Sufi area of the Ottoman Turkish, Iranian and Central Asia. Its kind of activity leads him yo alternate his concert career, solo, or as ensemble Maragi Director, as well as field research, writing, art direction and teaching various music programs, instrumental and academic. Followed by screenings of films and documentaries.